The ChemCollective is a collection of virtual labs, scenario-based learning activities, tutorials, and concept tests. Teachers can use our content for pre-labs, for alternatives to textbook homework, and for in-class activities for individuals or teams. Students can review and learn chemistry concepts using our virtual labs, simulations, and tutorials. The ChemCollective is organized by a group of faculty and staff at Carnegie Mellon who are interested in using, assessing, and creating engaging online activities for chemistry education. This interactive tutorial illustrates the steps in measuring the amount of food coloring in sports beverages to show qualitative and quantitative analysis techniques. 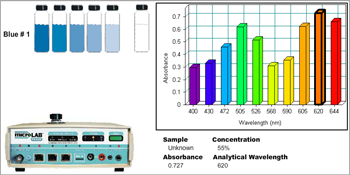 It covers chromatography, measuring UV/Vis absorbance and Beer’s Law plots. Sample calculations and automatically graded evaluation questions are also included. Release of new HTML5 Virtual Lab.